Because today is the DAY that we drink Christmas punch! Tree trimming is in full effect. Since we skipped out usual thirsty Thursday post yesterday, I just couldn’t wait until next week to share this with you! Because it’s the ultimate tree trimming weekend, right? Christmas punch to the rescue and you can find me by the fire, decorating the tree! I go back and forth. Some years I am ready for Christmas super early. Others I wait until Thanksgiving. This year I have been ready since, like, October! We ended up talking about this at dinner last night – and most of us have been ready for Christmas EARLY this year. But since I was hosting yesterday, I didn’t want to rip down all the pumpkin décor yet. It just didn’t feel right! Today, however… is another story. It is Christmas in full force over here. I am a decorating fiend. Christmas punch is on the menu. Along with TONS of leftovers. When I saw that bon appetit had a punch dedicated solely to decorating the tree? I knew I had to make my own. The base of this punch is lambrusco. It’s almost a little bubbly and it’s RICH. I’m having a weird moment with red wine. It’s crazy, because I haven’t been into reds for years now. The past month or so though? I’ve really been enjoying them – so I wanted to go with that. I used the base of my autumn syrup. Some orange juice. Pomegranate soda. Grand marnier since I’m obsessed. I also made some fun festive ice cubes. They are purely for appearances, and since I added rosemary, I removed the rosemary as soon as the ice started to melt. I didn’t want it to flavor the punch too much, you know? But do what you like! This is spiced, boozy, delicious and exactly what you need to string those lights up today. This tree trimming punch is the most perfect christmas punch to drink while decorating the tree! Rich red wine is the base and there's a bit of orange, some spice, cinnamon and a gorgeous jeweled holiday ice cubes! Note: if you want to make festive ice cubes, add some cranberries, pomegranate and rosemary to an ice cube tray and fill it with hot water. Freeze overnight! Add the ice cubes and orange slices to the bottom of a punch bowl. Stir together the syrup, orange juice, grand marnier, pom soda, lambrusco and club soda. Serve immediately! Enjoy. I’m ready for the sparkle. Looks amazing! Where did you get this incredible punch globe-bowl and glasses? Thank you! the only way to trim a tree! Love these ice cubes, thank you for this punch recipe! 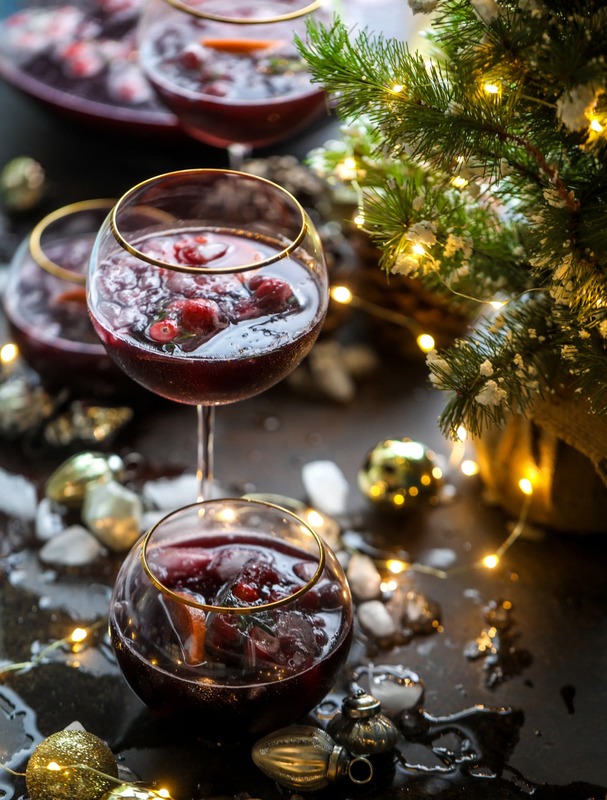 This punch looks perfect for the holidays! The recipe you shared from Bon Appetit looks great, too!! Love your photos! Oh my goodness!! This is beyond GORGEOUS!! And it looks delicious! Okay…. I need to know where to find the stemless globe glasses! They are beautiful!!! Do you have a link for the punch bowl and glasses? If you want to trim a tree easily according to the rules and regulation of a country then you must purchased the services of tree trim which help you to eliminate a big tree from a garden easily with the use of high tech machinery and especially self driving vehicles operate by a experience staff otherwise you may have loose by the broken of other house equipment . This is the most fun way to trim the tree!! No luck with the glasses yet though 🧐. Just wanted to chime in! Love the touch with the filled ice cubes. I made this for Christmas dinner and everyone LOVED it. A huge hit. Next time, I’m going to get the ingredients to double it because we actually ran out! I also loved the Autumn simple syrup. It gave everything a mulled wine feel. I wish I had found this during Christmas time. I’ll for sure make it this year.